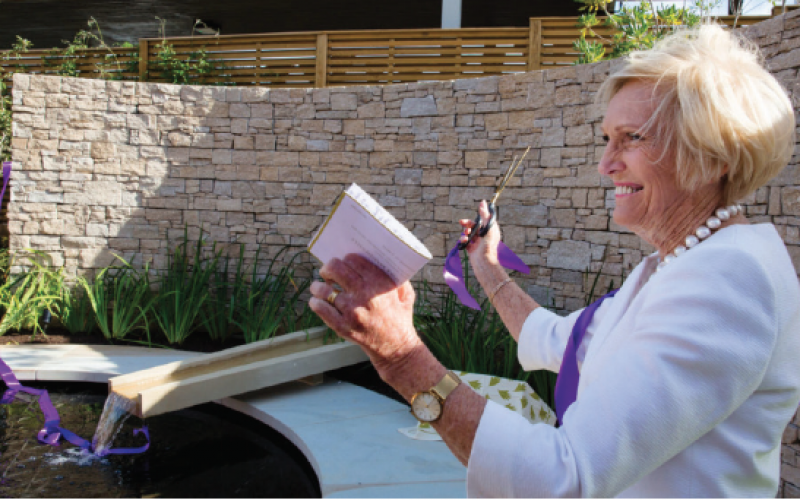 Chair of Trustees at Horatio’s Garden Olivia Chapple welcomed guests, supporters and patients to the garden in September to open the new garden at the National Spinal Injuries Centre in Stoke Mandeville. Joe Swift gave a brilliant introduction to his garden design and Mary Berry, President of the National Garden Scheme, cut the ribbon to commemorate the day. “Of course, a garden is never truly finished; it is an ever evolving story which will develop over the years with patients and our volunteers” said garden designer Joe Swift. Horatio’s Garden is a charity that creates and lovingly cares for beautiful accessible gardens in NHS spinal injury centres. Leading garden designers develop the stunning sanctuaries for patients, creating an environment which becomes an integral part of their lives as well as those of families and friends, while spending many months in hospital. Horatio’s Gardens provide patients with somewhere to find much-needed solace in an oasis of planting even if on bed rest; the garden is accessible for all. Patients can take part in gentle rehabilitation activities in the gardens organised by the charity, including garden therapy, art therapy and music events. Going forward, head gardener Jacqui and her team of volunteers will now be responsible for the upkeep and maintenance of the garden for patients at the spinal centre in Stoke Mandeville.